We Are Chicago was hardly the best game I played at PAX, one of gaming’s biggest gaming conventions, last month. It was rough and unfinished. My wife, at another demo station, barely got through it. In trying to depict life on the Windy City’s troubled South Side, it’s not trying to be fun, but it has to be interesting. It’s not there yet. The team may be biting off more than they can chew, but that could be a good thing. Chicago, the city I live in, isn’t in games often. Yeah, it was the setting for Watch Dogs, but ask any Chicagoan about it: they totally screwed it up. The creators of that game made weird choices about the city’s layout. Don’t get me started on how it portrayed every poor neighborhood in the city as a slum. That’s not the Chicago I know. This is why, despite its issues, I remain deeply curious about We Are Chicago, a game about Chicago being made in Chicago that hopes to convey what it’s like to live here. I want them to get this right, dammit. We Are Chicago is a brief glimpse into the average life of a teenager living in the most dangerous neighborhoods in Chicago. Drawing from real experiences, We Are Chicago shows an accurate portrait of the dangers and challenges of living amidst gangs and violence. You need to fight to keep your friends and protect your family and discover the true story of growing up on Chicago’s south side. “The project started as a thought experiment between friends about how you could tell a true story through games,” Michael Block, a programmer at the studio Culture Shock that is making the game, told me recently. Games telling stories isn’t novel, but they often have trouble reflecting reality. Most players come to video games expecting to be entertained, not wade through a history lesson. Some games, like last year’s This War of Mine, try to walk a fine line, using mechanics to engage. It presents designers with a dilemma that, for the most part, the medium still haven’t figured out. The South Side of Chicago has a notorious reputation for poverty and crime, a narrative earned and exaggerated. South Siders rightly resent the Chiraq nickname because it makes residents and visitors believe 60% of the city a war zone to be avoided at all costs, which isn’t really true. These places end up left behind; the stories of struggle lost to endless statistics, allowing Englewood and others to become neighborhoods read about in the paper but never visited. Unless, of course, you live there and don’t have a choice. We Are Chicago is a huge departure from Block’s last name, Organ Trail, a zombie-fueled take on the educational classic The Oregon Trail. The game’s financial success allowed him to take a risk. Thus, a few years back, Block and his team started volunteering around the city and interviewing South Side residents, past and present, to gain an understanding about life on the other, oft-ignored side of the city. They learned how a recent slate of school closings in the area lead to parents and children dealing with a new round of anxieties. To the outside world, it may have sounded like an inconvenience only requiring waiting on the bus a few extra stops, but it was more than that. Here’s how this translates into a video game. The demo at PAX Prime last month was on a PC, but it may come to consoles eventually. It opens with a black family getting ready for dinner. The family of three—mother, son, daughter—is currently entertaining a guest, one of the son’s high school friends. As the son, you’re able to freely walk around the home in first-person, chatting with everyone about their day, while laying out plates and silverware for the coming meal. That’s when the gunshots ring out, causing the family to briefly tense up before resuming dinner. While unsettling, this is “normal” for them, and the presence of idle gunfire is merely a reason to be a little more cautious on the way home, not panic and hide. The police are never called. When dinner is over, the son’s friend heads home, and everyone goes off to bed. The next scene takes place in the morning, as the son and friend head off to school. Along the way, they inadvertently cross paths with a group that instigates a fight. The demo closes with your character getting knocked to the ground, setting the tone for the world of We Are Chicago. According to the developers, not every situation in the game is life-or-death. They’re trying to avoid the negative stereotypes of mass media, which tends to depict places like this as endless strings of violence and depravity. You’ll hang out at the park, attend school, talk with friends, go to work, hang out at cookouts, and many other tasks that, while mundane, fill in the blanks of the day. “We really want people to come away with a better understanding of the day-to-day life in these neighborhoods and an increased empathy for the people living there,” said Block. The developers’ intent is good, but much of what they’re talking about wasn’t present in the demo I played at PAX. It’s unclear how this will all tie together. Will the characters be compelling? Can you actually make a barbeque enjoyable for the player? It’s one thing to have the desire to make something engaging; it’s another to actually do it. The game’s graphics may be an issue. We Are Chicago is trying to realistically depict a set of deeply complicated people, places, and situations. If the game’s art style were simpler or more stylistic, it’d be easier to forgive where it’s currently falling short. 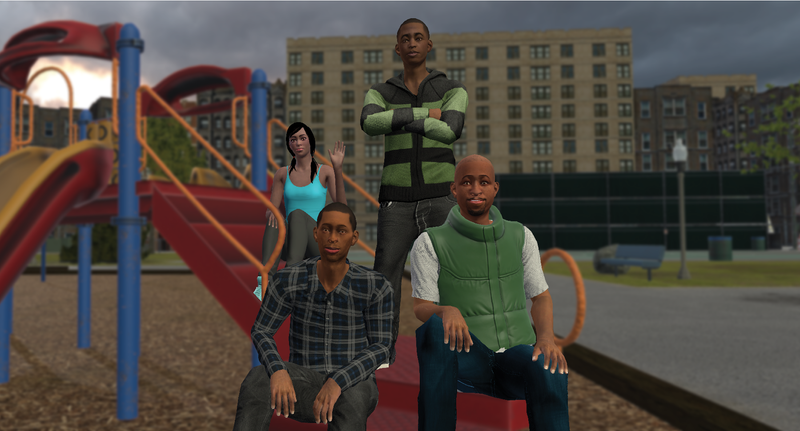 Things like hands accidentally falling through objects, awkward facial animations for the dialogue, and other small details will be crucial to get right, if We Are Chicago wants to accomplish its mission: generate empathy. When you walk around PAX, you see a lot of the same types of games. Endless 2D platformers, the cyclical big-budget sequels from the usual suspects, and lots of gimmicks vying for attention from a sea of people. We Are Chicago is quiet, contemplative, and may very well end up boring. I can feel myself wanting to give We Are Chicago a more leeway than I’d grant for, say, a new Assassin’s Creed. To some extent, that’s fair; we’re talking about a tiny development studio trying to figure out new ways of storytelling versus yet another open world action game. It was frustrating to play the game and be disappointed by it, because this is one of those games I want to be good. Besides being about my own city, it represents my own hopes for what games can (and should) be, allowing people a glimpse into the lives of others. When it comes to walking a mile in another person’s shoes, video games allow us to walk that walk. Hopefully, We Are Chicago can pull that off. We’ll see.